A vasovagal episode, or vasovagal syncope is a fainting spell that can be caused by many things. 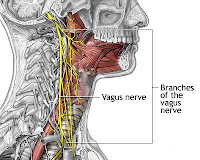 It involves the vagus nerve, a cranial nerve that connects the brain and the abdomen. The vagus nerve controls and coordinates various organs including the heart, major blood vessels and the muscles of the larynx (speech). Vasovagal episodes are the most common cause of fainting. Prolonged standing or upright sitting, particularly when standing with legs in a locked position for long periods of time—avoidance of long-term locking of one’s legs in the standing position is taught in the military as well as in marching bands and drill teams. Does anybody notice pattern here? Uh, water…um, hydration…water…nerve function…water. My guess is that Prez Sarkozy was running on empty; he was probably subclinically dehydrated. The French, like many people, drink dehydrating substances–liquor, caffeine–and if water levels are not replenished, then it’s easy to go into a water deficit. A water deficit doesn’t have to mean clinical dehydration–a medical emergency–but it can. Even so, subclinical dehydration is serious enough to cause fainting, among other symptoms and disorders. I devote much ink to subclinical dehydration in my book, The Six Keys to Optimal Health. Without a doubt, at least 50% of incoming patients to my Los Angeles, Beverly Hills, and West Hollywood chiropractic practice are operating at a water deficit. In a sunny and warm-weather climate like Southern California, being poorly hydrated is playing with fire. I’ll bet it is in Versailles, too. Anyway, Sarkozy is likely going to be fine. 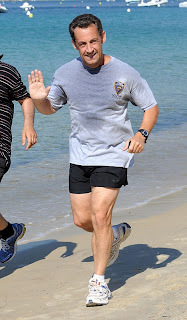 He’s a regular exerciser, often photographed while jogging with his entourage. Nevertheless, he is being looked at and evaluated by his doctors. Although the French President is routinely checked physically, his last reported health exam at the beginning of July where he had normal blood and cardiovascular tests, he was briefly hospitalized in October 2007 for treatment of angina (chest pain). The take home lesson here is for everybody to make sure they are sufficiently hydrated. Two liters of water per day is a good baseline. And if you are exercising in the heat, you might need more. Don’t mess around, stay hydrated–it could save your life.